* How to sing harmony intuitively, without reading notes or needing someone else to teach you your part. * A system to easily figure out high or low harmony parts to almost any song. * Techniques for singing without strain, staying on your part, and blending your voice with others. If you’re new to harmony singing, you’ll learn the basics in just one day. If you’re an experienced harmony singer, you’ll get some great licks, tricks, and techniques for finding parts faster and harmonising on-the-fly, even the first time you hear a song. You’ll be able to practice in small groups and get coaching from Sue. Come alone or bring your singing buddies or your band! To get the most out of this workshop, you should already be able to sing a melody fairly well in tune. If you’re comfortable playing guitar or banjo, please bring your instrument with you, as it will be helpful in our small group practice sessions. Here is a rare opportunity to polish your vocal performance with bluegrass singing and harmony coach Sue Thompson. Sue has taught for over thirty years in North America, Europe, and Japan, and is known for her high-energy teaching style, sense of humour, and her ability to focus in on just what each singer needs to boost skills and solve vocal problems. In this Master Class, your group will receive individualised coaching from Sue, and listen to the coaching of the other groups as well. Whether you want to sing with more power and relaxation, hit high notes without straining, develop a super blend or killer harmony, or just draw your listeners into the essence of your song, Sue will help you and your band bring out the best in your singing. Please come prepared with one or two songs you’d like to work on. There will be space for only three bands, so please register early to be sure you get a place! Sue Thompson is a noted vocalist, guitarist, and teacher with a lifelong passion for traditional music. An ace harmony singer and vocal arranger, she is also a powerful and soulful lead singer. Her recordings include Mike Seeger’s GRAMMY-nominated Third Annual Farewell Reunion, The Washington Traditional Fiddler's Project, Volume 2 — Generations, and the recent Western music extravaganza, Tall Boots, where her fellow musicians nicknamed her 'Harmony Part Wizard'. Sue is one of a small number of accomplished women flatpickers, and is also appreciated for her rock-solid, yet innovative rhythm guitar work. 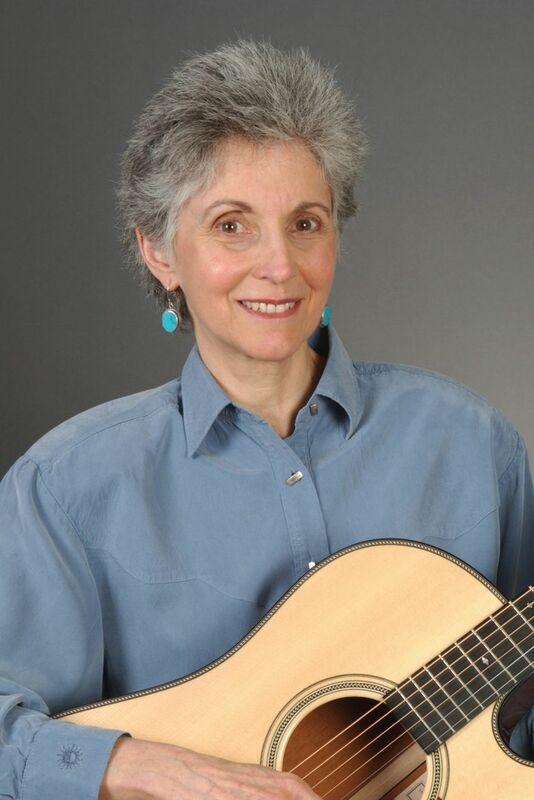 Sue has taught at the Puget Sound Guitar Workshop, California Coast Music Camp, British Columbia Bluegrass Workshop, Wintergrass Festival, and Port Townsend's renowned Fiddle Tunes festival and is becoming known as the premier teacher in Europe of how to sing harmony intuitively by ear. She has taught and performed at the Risør (Norway) Bluegrass Workshop and Festival, the La Roche Bluegrass Workshop and Festival in France, and the European World of Bluegrass Festival in the Netherlands, and has done workshops for the France Bluegrass Music Association, the Swiss Bluegrass Music Association, and Roots Experience in Germany. Sue currently performs with the Brandejs Band (Czech Republic) and the Field-Thompson Band.